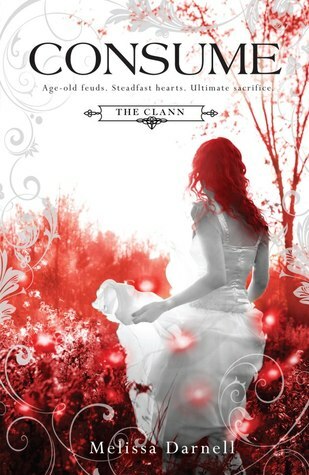 Lives up to its title.... Presenting The Clann #3 Consume by Melissa Darnell. Melissa Darnell made us "Crave" this story, "Covet" Sav and Tristan's romance and "Consume" it like an addict to drugs. the moment we dread in a series is here, the final book..... What began with sweet and shocking discoveries in Crave, ends with the romp of guns and roses in Consume. Covet saw Savannah Colbert turning Tristan Coleman into a vampire as a last ditch effort to save him. And now it all over the place. Savannah sired him but now Tristan is a vampire. Its hard enough for her to cope with what had happened in the last book but keeping things in is even more of a problem, now that he can read her mind. Add to that the deception, the chase, the bloodlust and that of the reveal of shocking truths and the eminent build upto the final confrontation really topped it off. Savannah and Tristan really shone through if it was possible to get them more stronger as characters than they already were. Savannah became the voice of reason to Tristan's rash decisions. She has dealt with from people enough to know what revenge is never the answer because once you have accomplished what you set out to do to tend to loose your way if you don't have anything to fall back o. Something that Tristan doesn't want to understand. Tristan's situation is understandable. The Clann had given him enough grief as it is. But things happen that set him off even more. He wants to hurt the perpetrators because the disaster happened because some people wanted power. And its not just our power couple but our secondary characters too had their moments in there, enough for them to leave an impression upon us of their characteristics that set them apart. The romance factor sure makes the swoon worthy moments. Savannah and Tristan truly are made for each other and them braving the tension and dangers of the coming war between vampires and witches and coming out stronger is testament to their love..... the fact cemented by Darnell's exemplary plot line. Such strong sentiments, writing and the buildup to the climax is definitely worth the wait.... Can't wait to known it when it comes out.... Also an adult novella based in the Clann world released last June named "Dance with Darkness" hope I can get it soon. "Consume offers to dazzle you with its exquisite finale"
Loved your review! I've been reading this series but completely forgot about it until I saw your review! !